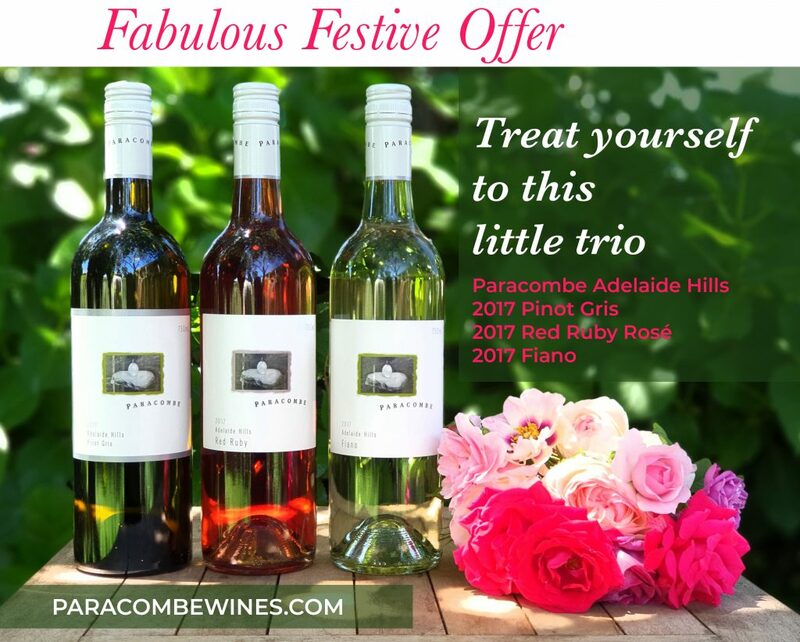 Treat yourself to this trio of delicious Paracombe Adelaide Hills wines. Summer is the time for crisp whites and fruity rosé, and with Christmas fast approaching; here’s the perfect gift. We can arrange delivery directly to you or if you are using your purchase as a gift, it can be sent directly to the lucky recipient. This very special offer makes a thoughtful corporate gift and a personal note can be included with your gift shipments. FREE Delivery on six packs. Orders go into a draw to win a bottle of Paracombe Pinot Noir Chardonnay Sparkling valued at $35.00. Special offer expires 7th December 2018. Price $120.00 (A saving of $6.00) PLUS free freight. To redeem the offer for free fright (6 pack only), you need to enter ‘FABULOUS’ as the coupon code on the cart OR checkout page. Not a member of the Paracombe Wines Family?